For some time I have been gathering a collection of maps I've come across online. Partly because I want to write a story about a story with a map in it and partly because I like maps a lot. Particularly maps of imaginary places or old maps of places as they can only be imagined now. 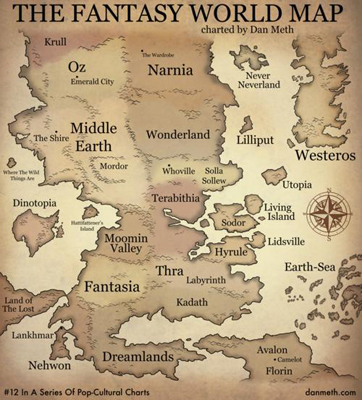 The Fantasy World Map is by Dan Meth who says on his blog 'Finally! I’ve charted the very first accurate map of the entire fantasy world. Nerds will rejoice! …Or become enraged!' (well there are a few places missing...). This is a tiny part of Bernard Sleigh's An anciente mappe of Fairyland: newly discovered and set forth (you really have to follow the link to appreciate the scale of this one). Sleigh was a Birmingham artist and he drew the map in 1920. This is the map for Neil Gaiman's poem Instructions, drawn by Charles Vess for the opening spread of the beautiful book of the poem. I've always loved books that begin with a map. I think it's because as well as being a sign of a journey ahead, a fictional map gives an imagined world more solidity. 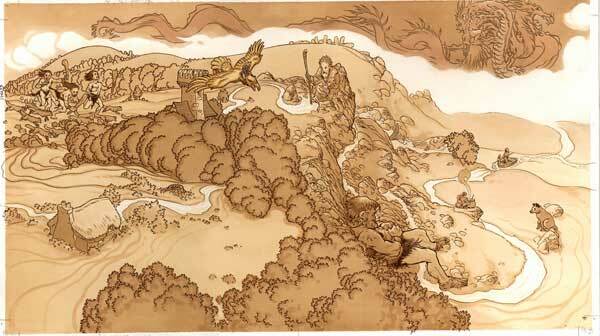 Fantasy Atlas has a great collection of maps from fiction (the titles are in German). 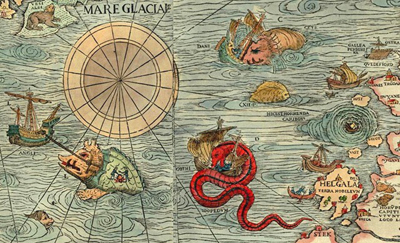 And there is a good blog post on 'Maps of Fictional Worlds' here and another lovely one, by the writer Katherine Langrish, on 'Other Worlds' in fiction here. I once wasted more time than I'd like to admit trying to find a map with the words 'Here be Dragons' on it (or 'Here be Monsters' would have done) before reading here that the actual words 'HC SVNT DRACONES' ('hic sunt dracones', Latin for 'here are dragons') actually only appear in one place and that's on the Hunt-Lenox Globe. 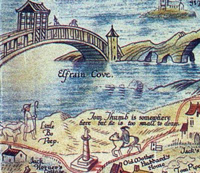 There are, however, pictorial monsters aplenty to be found on maps. The ones above are from the Carta Marina, created by Olaus Magnus in the early 16th century. 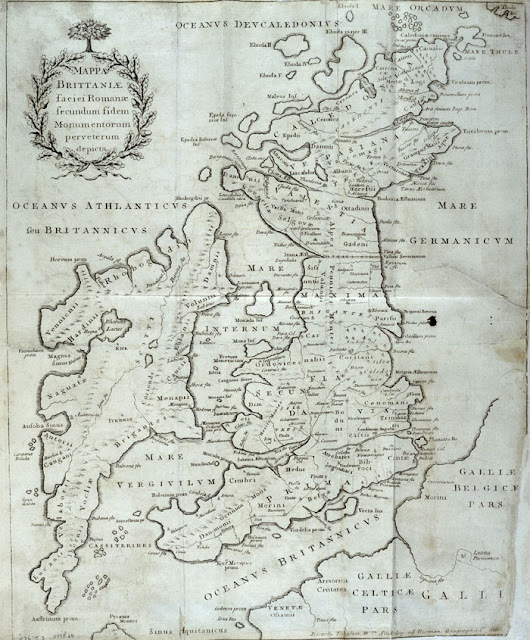 There is a brilliant article on 'Modern Medieval Map Myths' on Strange Horizons. One of my favourite real (as opposed to fictional) maps is also a fiction. This map was faked by Charles Bertram in the 18th century. He claimed that he'd discovered it along with an ancient manuscript called De Situ Brittaniae. The antiquarian William Stukely believed it to be the work of 14th century monk, Richard of Cirencester. What I love most about the map is that it gives the first reference to the hills I have spent the majority of my life living by as the Pennines (on the map it says 'Pennines Montes'). It was accepted that this was a lost Roman name for the range and long after the discovery of the forgery in the 19th century the name remains. There are lots of intriguing maps on the British Library site. Map History has an enormous amount of links to explore. There's an 'Incomplete Evolution of the Cartoon Political Map' here. Stephen Walter's incredibly detailed map of London as 'The Island' and his Liverpool map. Sohei Nishino's beautiful photographic map of London (currently on display at the Michael Hoppen Gallery in London, along with maps of other cities, night and an imaginary city). A partial map of your TARDIS. A map of online communities. A map of the blogosphere.